Radiant Historia: Perfect Chronology - It's been six years since Radiant Historia was released on Nintendo DS in 2011, but it's time to return to Vainqueur and unlock the time traveling power of the White Chronicle once again in Radiant Historia: Perfect Chronology. This beloved classic is an expanded Nintendo 3DS port of the original game that will contain a great deal of added gameplay/story content, updated presentation, and new ways to experience the adventure! An Enhanced Retelling of the Original - You'll once again take the reins of Alistel operative Stocke as he unlocks the power of the White Chronicle relic and gains the ability to travel between two alternate timelines. With his new-found powers, Stocke will need to right the wrongs of the past in order to prevent the total annihilation of the world. This time though, things are a bit different. Redesigned character art, new character voice-overs, a brand-new opening animation by A-1 Pictures, new theme song, event illustrations, five new tracks from original composer Yoko Shimomura, and additional difficulty settings will enhance the experience in this fresh take of a beloved story. Exhilarating New Story Content - Stocke will now encounter a mysterious new character named Nemesia who will teach him more about his world's history and unlock a third timeline to explore the ripple effect of some of his actions with episodic "what-if" scenarios. If you're a Radiant Historia purist who simply wants to play through the original game's story, we have you covered! Perfect Chronology offers two different modes: Append and Perfect. Append mode allows you to beat the original game before having the option to start a NewGame+ with the added content, while Perfect mode lets you play through the game with the inclusion of the third timeline from the beginning. A Classic That Can't Be Missed - Even though there's an abundance of expanded content to delve into, the heart and soul of Radiant Historia remains the same. If you missed out on the original game in 2011, the upcoming port is the perfect chance to play a modern classic. 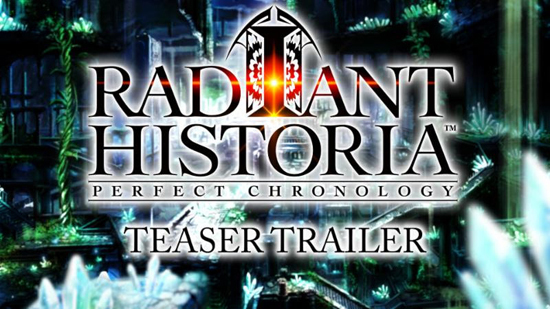 With an exciting positioning-based battle system, memorable characters, and thrilling time-travel mechanics, Radiant Historia: Perfect Chronology is an essential for JRPG fans.